In this tutorial, I will show you an example of how four worker thread waits for other before starting again. As I told in the previous article, concurrency is hard to master, sometimes even if you read a couple of articles on one topic, you don't get what you are looking for. If you understand how and where to use CountDownLatch and CyclicBarrier, then only you will feel confident. Books are also good for mastering concurrency, and one book, in particular, is very useful to learn multi-threading and concurrency in Java. You guessed it right, I am talking about Java Concurrency in Practice by Brian Goetz, I strongly recommend this book to anyone seriously wants to master threading and concurrency in Java. If you can't get first hand, get a second hand one, if you can't buy then lend it from library but if you are serious about Java concurrency, you should read it. You just cannot understand concurrency without an example, seeing is believing here. It's difficult to comprehend words like worker thread, parties, waiting for each other at a point, until you see it live in action. In this program, we have four worker threads and one main thread, which is running your main method. 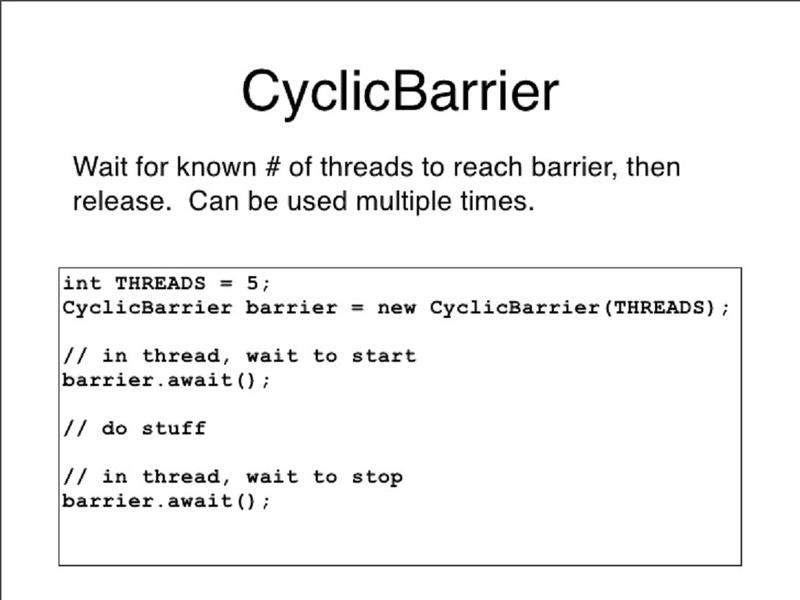 We have an object of CyclicBarrier, which is initialized with parties = 4, the argument we passed in CyclicBarrier constructor is nothing but number of party, which is actually number of threads to stop at barrier. The barrier will not be broken until all parties are arrived. A party (thread) is said to be arrived with it call barrier.await() method. In our example setup, we have given each worker thread a different name, starting from PARTY-1 to PARTY-4 just to have a meaningful output. We have passed the same instance of the cyclic barrier to each thread. If you look at their Runnable implementation, you will find that each party sleep for some seconds and then call await() method on the barrier. The sleep is introduced so that every thread calls barrier method after some time. Sleep time is also in increasing order, which means PARTY-4 should be the last one to call await. So as per our theory, every thread (party) should wait after calling await() until the last thread (PARTY-4) calls the await() method, after that every thread should wake up and start processing. 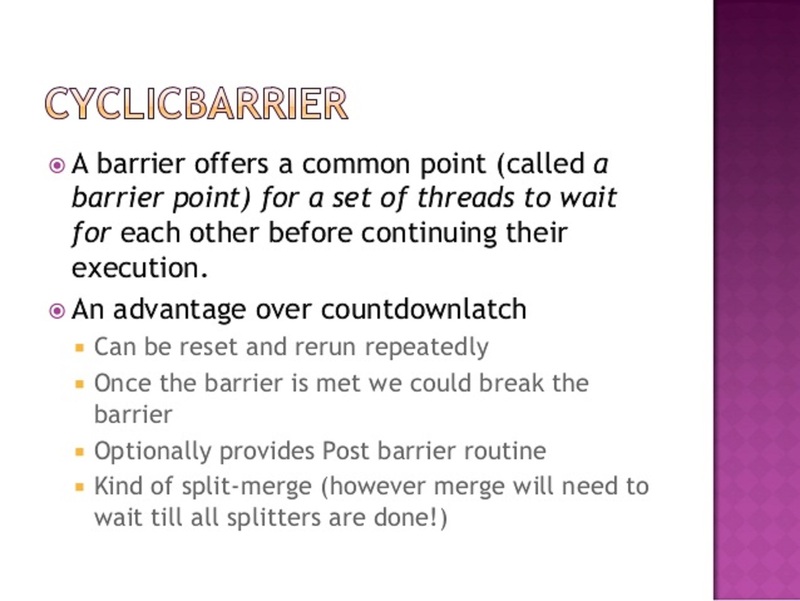 Of-course they need to compete for CPU and they will start running once they got the CPU from thread scheduler, but what is more important is that once the barrier is broken, each thread (party) becomes eligible for scheduling. 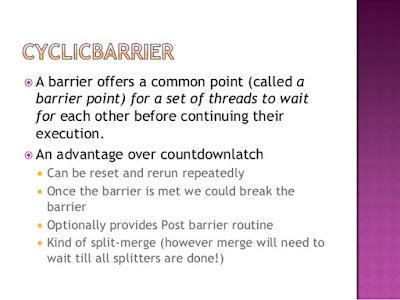 By the way, you can reuse the barrier even after its broken this is where CyclicBarrier is different than CountDownLatch. * needs to wait for each other before starting again. If you look at the output is exactly matches with our theory. Each worker thread (PARTY 1 - 3) calls the await() method and then they stop processing until PARTY-4 comes and call await() method, after that every thread gets a wake up call and started execution again, depending upon when they are scheduled by Java thread scheduler. This is how CyclicBarrier class works. You can still reuse the barrier object and if a thread calls barrier.await() again, it will wait for four worker thread before it gets wake up call. By the way, If barrier is broken before a thread calls await() then this method will throw BrokenBarrierException. 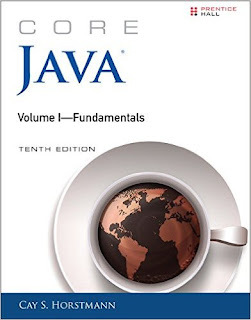 See Core Java Volume 1 - Fundamentals by Cay S. Horstmann to learn more about these higher level concurrency utilities in Java. It is a very useful class and have several practical uses. You can use this to perform final task once individual task are completed. You can use it to write some unit tests to check some variants as well. Remember you can reuse the barrier as opposed to latch. One a side note, this CyclicBarrier example is also a good example of how to catch multiple exception in one catch block in Java, a feature introduced in JDK 1.7. You can see that we have two unrelated exceptions InterruptedException and BrokenBarrierException, but we have caught then in same catch block, because of this feature, this code requires Java 7 to run. If you are not using JDK 7 then just use two catch block instead of one. 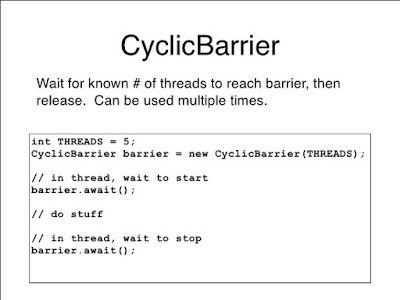 That's all about how to use CyclicBarrier in Java. In this CyclicBarrier Example you have not only learned how to use CyclicBarrier but also when to use it. You should use it when one thread needs to wait for a fixed number of thread before starting an event e.g. Party. You can use CyclicBarrier to write concurrency unit test and implement generic algorithms in Java.